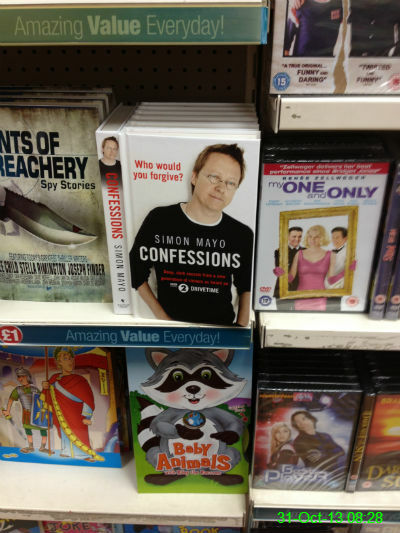 I was browsing the shops before work and noticed this book based on the Confessions feature on Simon Mayo's radio show. I haven't read this book, but I do listen to the weekly podcast. I'm yet to come up with any suitable confession of my own to submit! 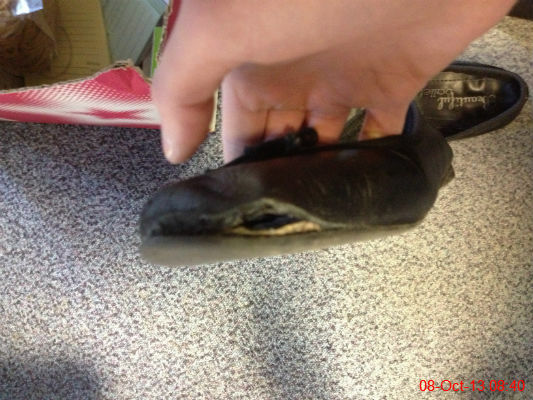 The heel has gone missing from the bottom of one of my boots so I'm basically walking on plastic. It makes for a lovely lopsided echo when I walk through an underpass. 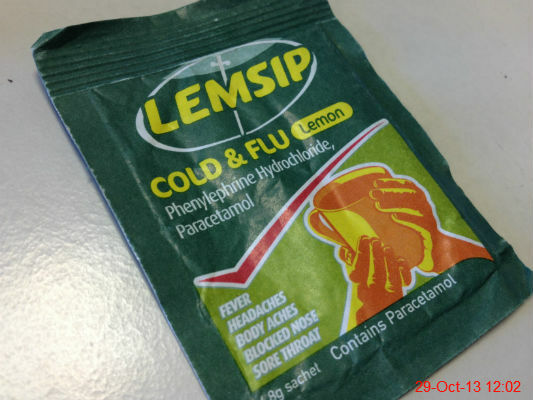 I'm suffering a cold so I decided to try a Lemsip to clear my fuzzy head. 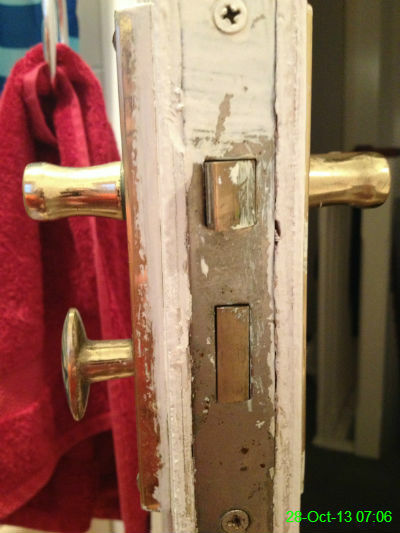 This is the lock on our bathroom door, and the interesting paintwork that surrounds it. It wasn't an enjoyable derby day as Newcastle lost 2-1 at Sunderland, so instead we amused ourselves by taking it in turns to attack Chris, because he doesn't like being touched. 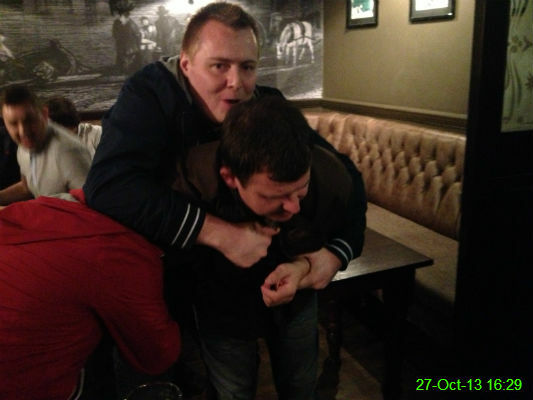 This was a joint effort by Craig and James, and the poor man behind them looked terrified. 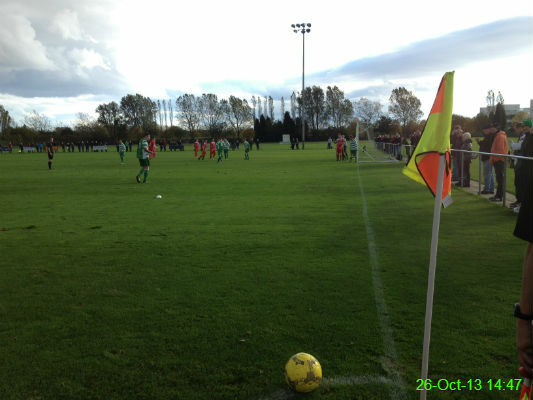 West Allotment Celtic held North Shields to a goalless draw in a game which really deserved a goal. As the match was part of a series of staggered fixtures for Groundhoppers Day, there were 429 in attendance which was quite a bit more than usual! I was over the moon to hear one of my oldest friends, Gemma, had recently become engaged to her boyfriend John. 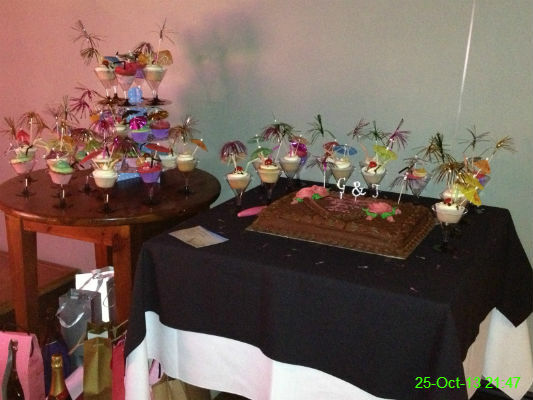 They threw a party and this was the dessert centrepiece - a beautiful cake surrounded by lots of amazing cupcakes. 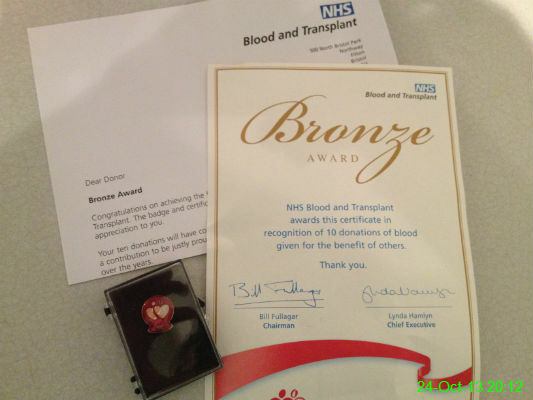 I donated blood for the 10th time today so I received my bronze award pack, which contained a certificate and a badge. It was an eventful donation, as it took 3 attempts to convince the nurse that my iron levels were high enough to donate, and then once I'd finished the hole in my arm wouldn't stop bleeding for ages! I treated myself to 2 biscuits afterwards instead of just one. I think I earned it. 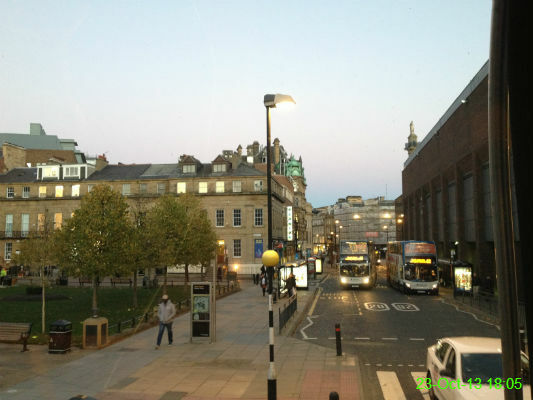 My view from the top deck of the bus along Blackett Street as I waited patiently for it to set off on the journey home. 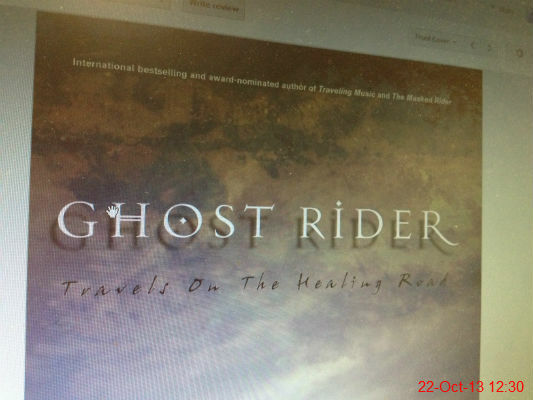 This is the book I'm reading at the moment - Ghost Rider: Travels on the Healing Road by Neil Peart, the drummer from Rush. I admit the decision to read it was based solely on being a Rush fan, but so far it's a very good read, and it means I'm putting the Kindle app on my phone to good use at last. 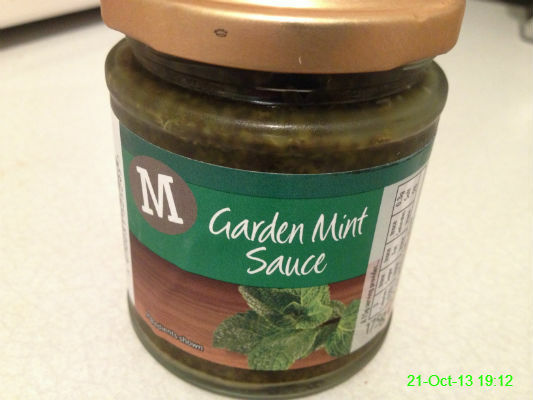 I took a risk buying this as I usually always get Colman's mint sauce, but it was acceptable. 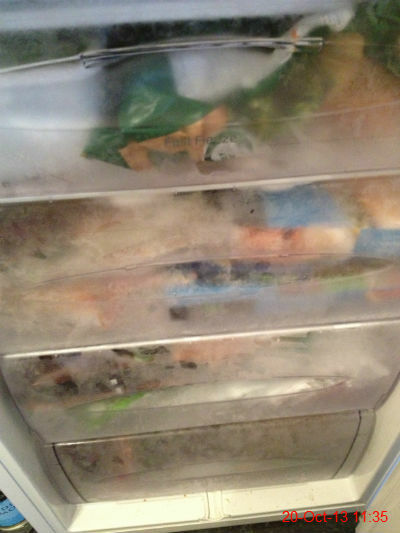 Asda delivered my shopping today, so for a change each of these compartments is full. Michael and I were just going to head home after today's match (2-2 home game against Liverpool) but instead we had the opportunity to catch up with Mak. 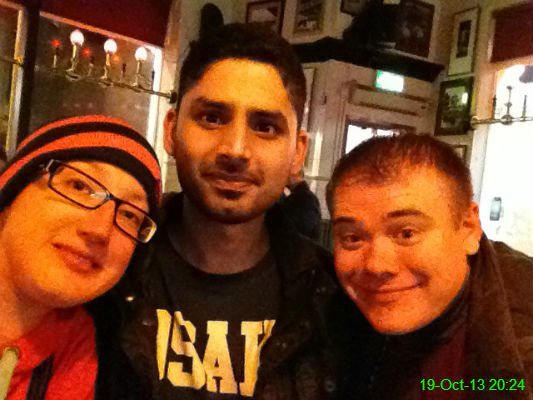 As with any other matchday.. it ended in Rosie's. 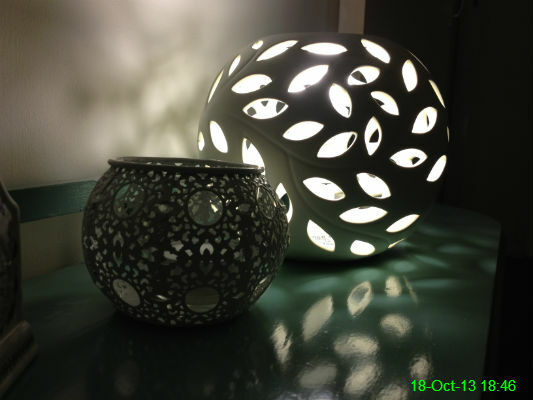 Mam and Chris will recognise this - it's the cute little lamp on their hall table. 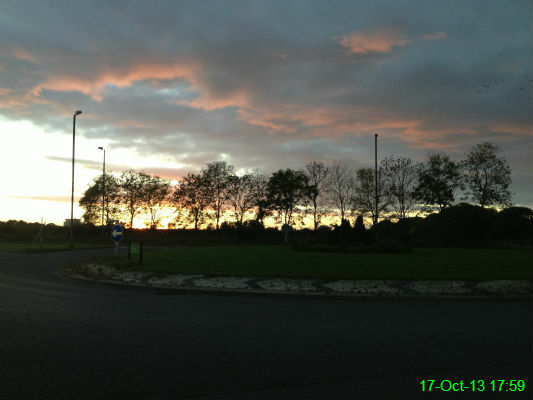 It was a lovely and mild evening so I decided to walk home from work. 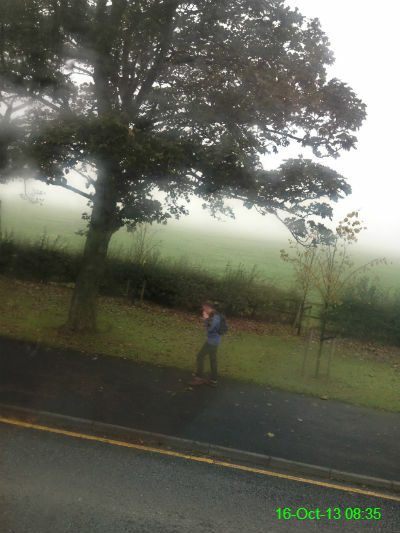 It was around 6.2 miles in distance and took about an hour and a half. According to the BBC Weather app on my phone, sunset was at 18:03 today so I was pleased to catch a glimpse of the beautiful sky shortly before then. Above a roundabout. I haven't got the hang of this photography thing, have I? The Town Moor was very foggy as I got the bus into work this morning. I didn't mean to include this poor gentleman in the photo, but at the time I didn't notice him as I was waiting for a gap in double decker buses going the other way and trying not to let anybody on my bus see me take a photo of what would look like absolutely nothing. 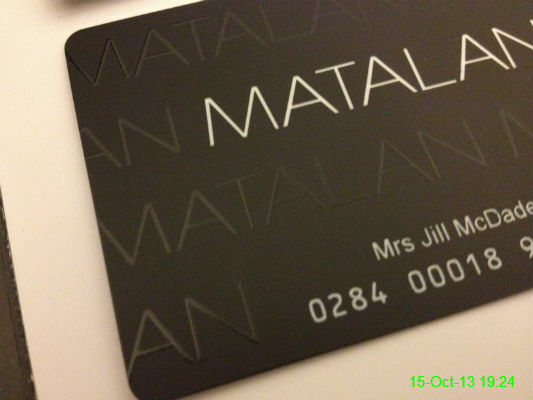 I've received a black Matalan card, which is apparently to reward me for spending over £150 there in the last 12 months. I've no idea how I've managed to do that, but if that's what they say.. fair enough! I'm not sure why they've decided I'm a Mrs though. 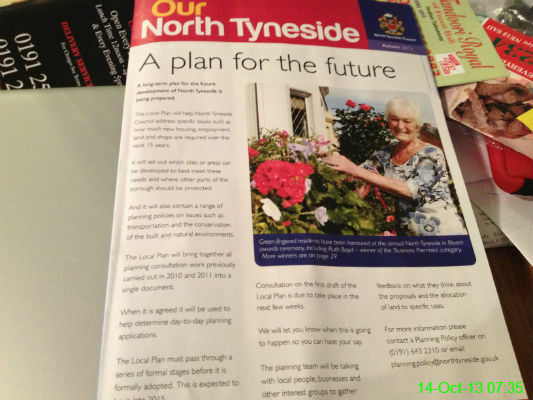 While I ate breakfast this morning I flicked through this booklet from the Council. 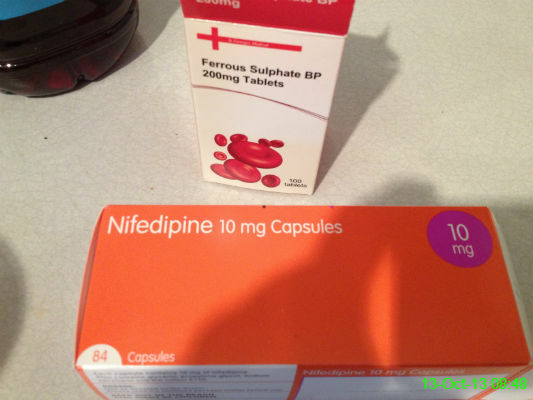 This is what I've been prescribed to help my Raynaud's: iron tablets and nifedipine. 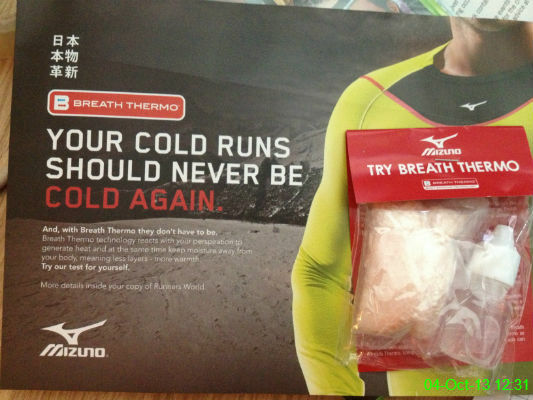 I really hope this helps because I can't bear the thought of another winter with numb, discoloured fingers. 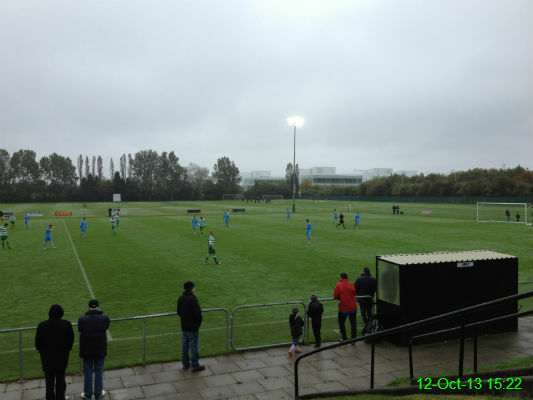 Since it was a grey and murky day, the floodlights were turned on at Whitley Park during the first half of the match. A very depleted Celtic side was able to hold on for a crucial win against their promotion rivals. 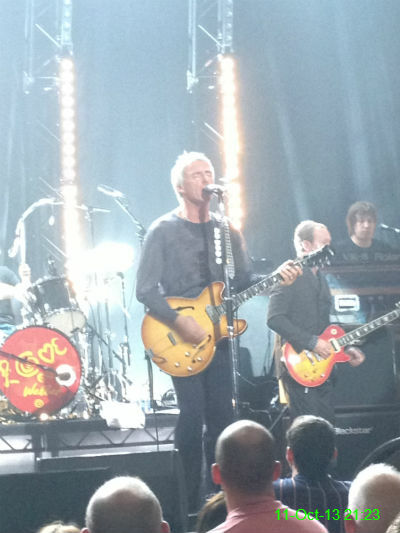 My birthday present from Michael was tickets for us to go and see Paul Weller at Newcastle City Hall. It was excellent and we had a really good view from row K! This cheap juice is surprisingly tasty. 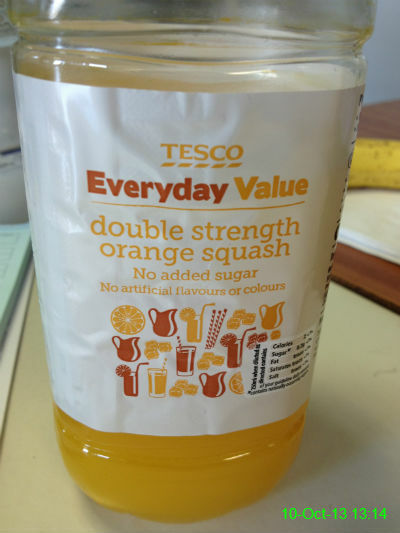 It reminds me of the juice I used to drink at school fairs many years ago. 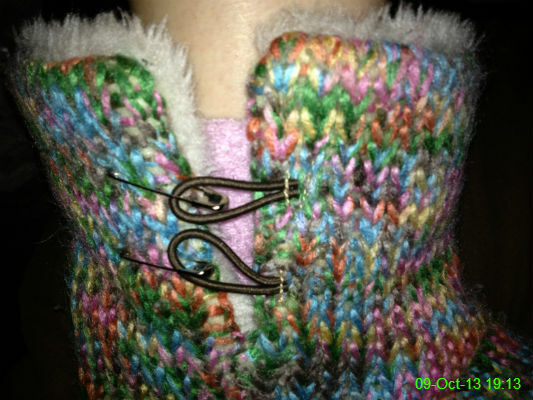 Both buttons have fallen off this slipper so I've had to resort to plan B - safety pins. 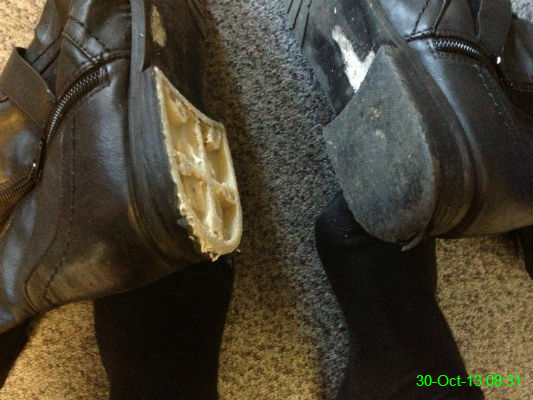 No doubt about it - I need to replace my work shoes. Preferably before it rains. 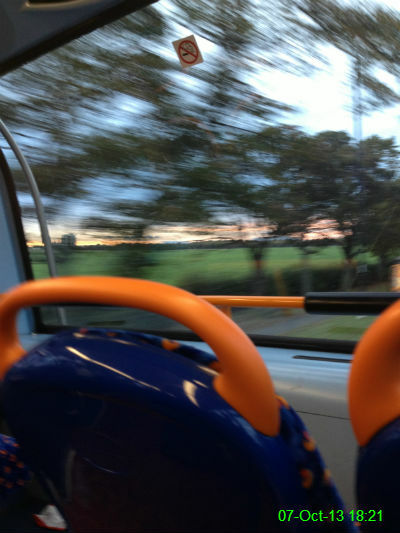 The bus journey home passed in a bit of a blur but I couldn't help noticing that the sun was close to setting. It was almost dark by the time I got home. 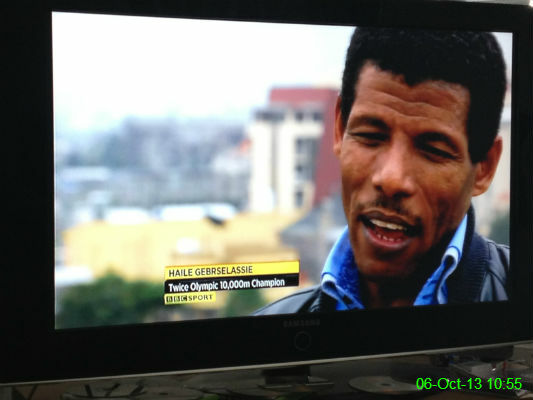 The Great Scottish Run was taking place today and thankfully I wasn't taking part - instead I watched as the legendary Haile Gebrselassie won and also beat the course record. 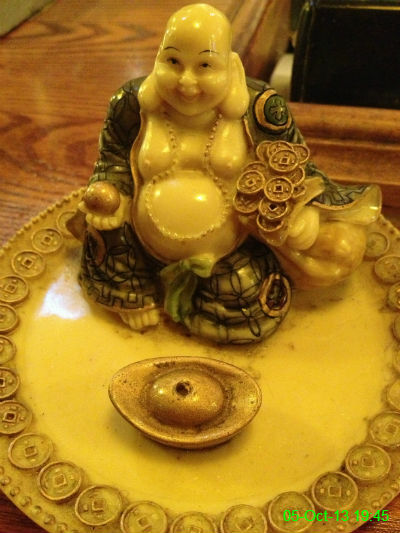 I'm sure it's for good luck or something, but this ornament at the Wheatsheaf just looks plain creepy to me. I also think It also looks alarmingly like the actor Matt Lucas. This came with the latest edition of Runner's World magazine. The idea is to drop water onto the fluffy bit as if it was sweat, and see how it warms up as you hold it in your hands. I wasn't impressed, and believe me my hands need warming up! 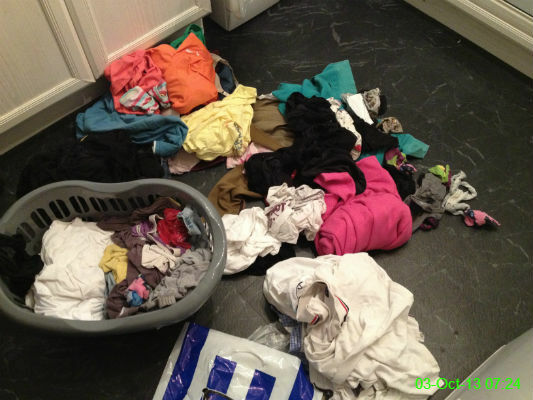 With the holiday over, it was time to start on the washing, which was something of a crash back down to earth. 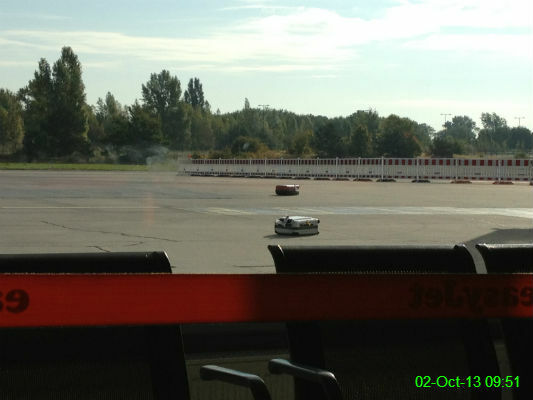 A luggage truck took a corner a bit too quickly and several suitcases flew off the back. They were rounded up by another member of airport staff but I suspect there were some very concerned people waiting around the baggage carousel! As our flight was delayed by over half an hour, it was something to keep us entertained as we waited at the gate. 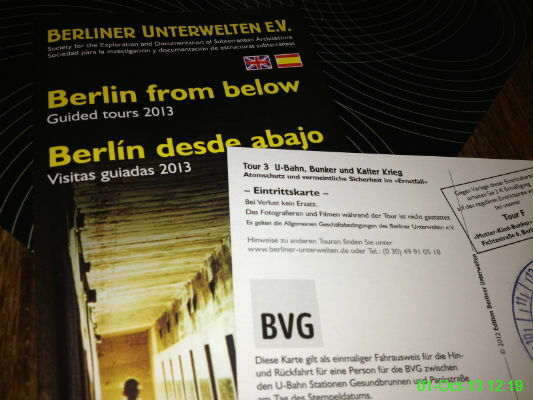 We went for a tour of two Cold War Bunkers which were linked to U-Bahn Stations. Unfortunately photography wasn't allowed on the tour, but it was a great insight and something I couldn't have imagined being right under my feet when walking around the city.